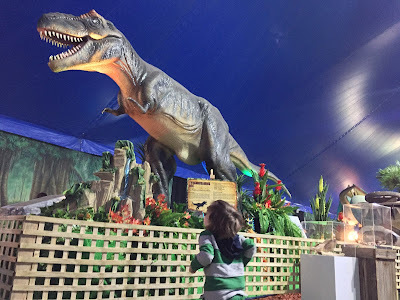 We were given a family pass to check out Jurassic Creatures by the wonderful people at Cavanagh PR. All opinions and photographs are our own. I wasn’t quite sure what to expect when we arrived to see Jurassic Creatures. My first impression came from the ample signage from the Docklands tram stop and right the way through Harbour Town. The ticketing staff were efficient and friendly, and with three eager kids in tow, we lined up for the promptly-opening 10am session. From the outset, this is really engaging both visually and aurally. 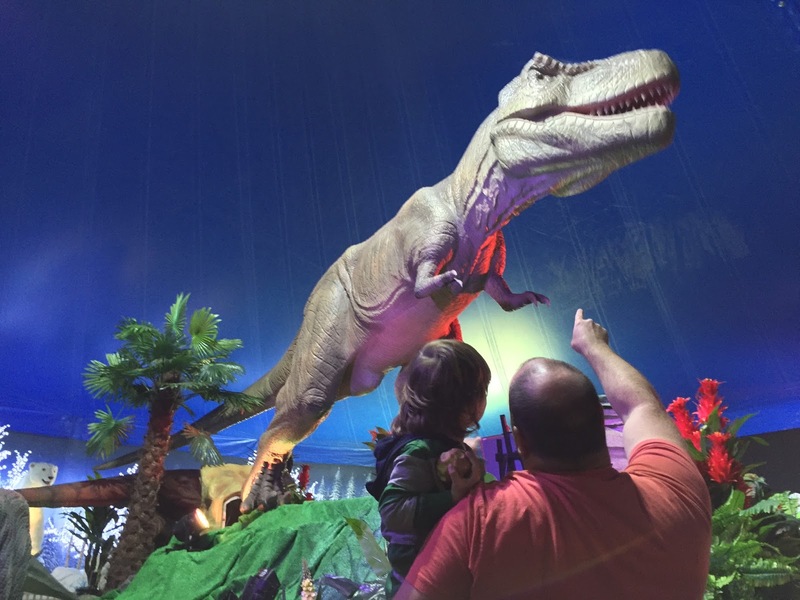 The family loved hearing the loud roars and seeing the animatronic dinosaurs from outside the tent. Upon entering the tent, the camera got a workout! This place has lots of photo opportunities of the kids interacting with both static and animated dinosaurs, with great lighting. Whilst there was lots of looking skywards to see the pterodactyls, mammoths and the ferocious T-rex, the display is designed for kids, with the vast majority of displays (and information plaques) at head height for littlies. Jurassic Creatures is clever – not only is it a display-based attraction, it provides other activities designed to engage and peak curiosity. 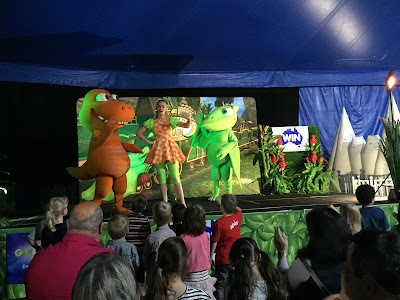 The kids could join in the songs and dance right in front of the stage where your host has the kids right in the palm of her hand with her dinosaur pals, Buddy and Tiny. The kids enjoyed becoming a palaeontologist and discovering different fossils which they could keep. A big winner though, was the art and craft, where kids could make their very own colourful dinosaur sand art to take home! 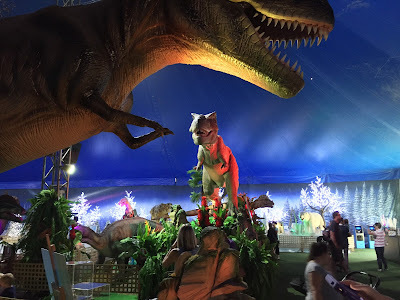 After being a bit dinoed-out, we stepped outside into the park’s amusement section, where the kids could go on unlimited rides on trains, jumping volcano, pirate ship and cup ride. Whilst there are food and merchandise stands throughout the facility, these are incredibly reasonably-priced! The icing on the cake was the voucher we were handed, giving us $15 tickets for the Melbourne Star, right next door, upon presentation of our Jurassic Creatures ticket. 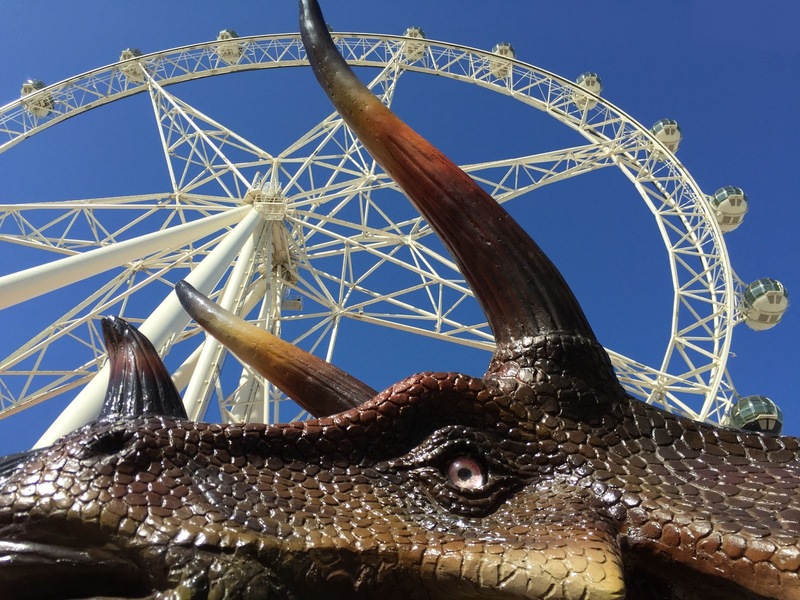 Jurassic Creatures must close on Sunday 10 April, which gives parents an opportunity to give the kids a very cool experience in the remainder of these holidays. We loved it, and hope you will too! Tickets for Jurassic Creatures start at just $22 each. A family pass is $105. They can be booked online here.